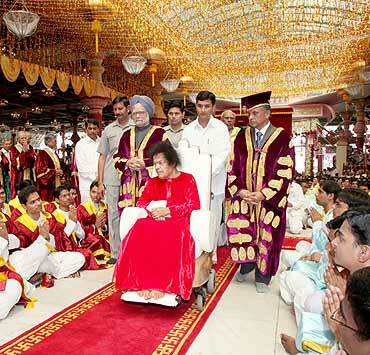 Rediff.com » Business » Will Puttaparthi's economy survive Sai Baba's death? 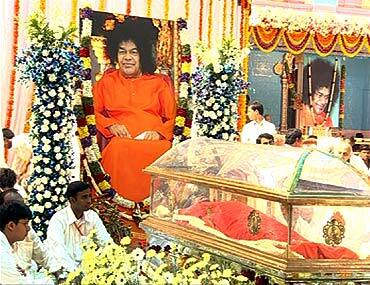 Will Puttaparthi's economy survive Sai Baba's death? "Puttaparthi will become super Shirdi. People will start coming more frequently and in greater numbers. Just wait and watch," a senior Railways official in the Capital and ardent Sai Baba follower tells me the day before I leave for the town that Sai Baba built, a week after he passed away. But when you look beyond the clouds of incense sticks and devotee-speak in the clear light of the harsh summer sun, the panchayat in Andhra Pradesh's Anantpur district that revolved around one individual has a different story to tell. That one individual is still omnipresent in Puttaparthi -- whether in the form of images on various hoardings en route and on the huge pink and pale yellow arch at its entrance or on posters stuck behind almost every auto-rickshaw plying its roads. 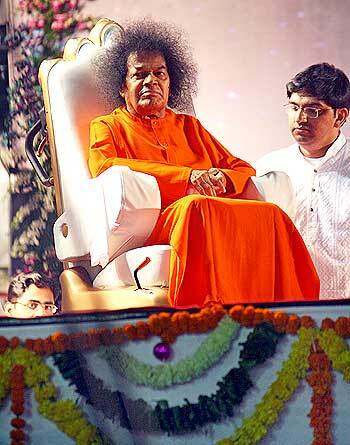 Can Puttaparthi's economy survive Sai Baba's death? 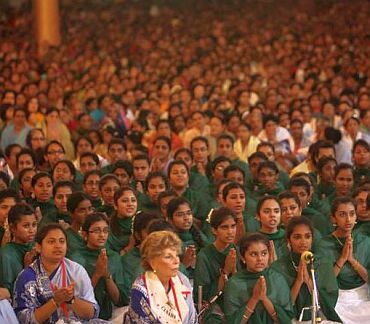 He's present in the "Sai Ram" with which people here greet or hail one another -- be it fellow-devotee or inattentive restaurant waiter. And he's there in the name of nearly every business venture in town. But with Sai Baba passing away on April 24, the future of these very business ventures, spanning real estate and hospitality to small shops in bylanes selling Sai Baba paraphernalia, is more than a little shaky. 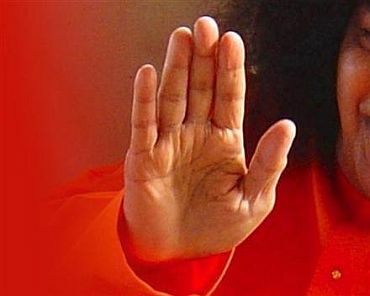 For one, the hordes came to Puttaparthi not for the stadium, colleges, super-specialty hospital or other institutions commissioned by Sai Baba but in the hope of catching a glimpse of the man himself and listening to his discourses. As one shopkeeper in town puts it, the main 'charm' of the place was Sai Baba. So although devotees have been schooled to believe his physical form does not matter, it may be left to the town's businessmen to find out that it does. 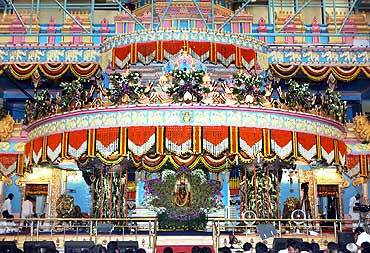 Even supposing that the number of devotees visiting does not decline, the duration of their visits would. "Previously, people would stay even for six months at a time for darshan of Baba and to hear his discourses. But they are unlikely to spend that much time to see a samadhi, especially devotees from abroad," says an officer in the Puttaparthi branch of a public sector bank. Once the crowd visiting Puttaparthi thins, the first ones to shift to greener pastures will be the Kashmiris who run around 120 handicraft and garment shops. "When Baba was here, it was as if the whole year was 'season', apart from the peak summer months. Even the recession hardly affected us. But now things are absolutely uncertain and we might soon have to think of shifting to other places like Bangalore," says Aftab Ahmed, the first Kashmiri to set up shop here, 30 years ago. "Truth be told, even I am looking at the option of shifting, though I came here in 1980," he admits. In a good 'season', Ahmed sees sales of Rs 10-15 lakh (Rs 1-1.5 million). Fellow Kashmiri Afaq, who runs a small shop selling garments opposite the Prashanti Nilayam ashram, echoes Ahmed's sentiments. "With Baba gone, if things don't look well, I'll have to shift elsewhere." With hardly any of them being devotees, the choice is easy for the Kashmiris. Not so for the locals who have ventured into real estate, the sector universally acknowledged as the one to be the hardest hit by Sai Baba's death. Over the past five years, real estate was riding the Sai Baba wave like never before. Buyers were devotees who would occupy the flat for a few months in a year. An executive in the Puttaparthi branch of a private bank says land prices had risen 100 per cent in the last one year. The average price for apartments had touched Rs 800-1,000 a square foot, with deluxe apartments going at Rs 1,200 a square foot. Land 1 km away from town that cost Rs 20,000 a cent (a cent is a hundredth of an acre) three years ago had gone up to Rs 4 lakh (Rs 400,000). Current prices are now anybody's guess -- the bank executive estimates land prices to have fallen 30 per cent since Sai Baba was hospitalised a month ago. "We, the local builders, have decided not to sell below Rs 1,000/sq ft for the moment," says Kesava Jyoti, the secretary of the 78-member-strong Puttaparthi Builders' Welfare Association and owner of Sai Ravi Teja Builders. But that resolve might last only till creditors' patience runs out. Jyoti says there are around 300 apartment complexes in the town of varying sizes, with 60 under construction. Most of these have been launched by standalone developers, some of whom started with capital of as little as Rs 10 lakh (Rs 1 million). The gap in funds was usually filled by private financiers (rather than banks) who were more than eager to give soft loans at 2-5 per cent, though there were takers even for loans with 15 per cent interest. These once-generous financiers, mostly from the neighbouring areas of Dharmavaram and Bokkapatnam, have now started tightening the screws. All this has been weighing on the minds of people like Raghavendra Reddy of Sri Sai Prashanti Builders. Reddy has been a resident of Puttaparthi since 1983 when, according to him, Sai Baba cured his father's liver cancer (with the words 'cancer cancelled'). In the real estate business for the past six years, he is worried about the future. "People will still come to Puttaparthi but now they might just come for a couple of days instead of a couple of months," says Reddy who has taken loans from private lenders for his projects -- loans he is now unsure how he will repay. Reddy and many others who insist that they will not abandon Puttaparthi feel business will be dull for the next six months, and then pick up. But with the glut in the market, and demand being uncertain, it is more likely to take much longer. The public sector bank official quoted earlier says a couple of his customers have already told him they would like to sell their flats or at least rent them out. 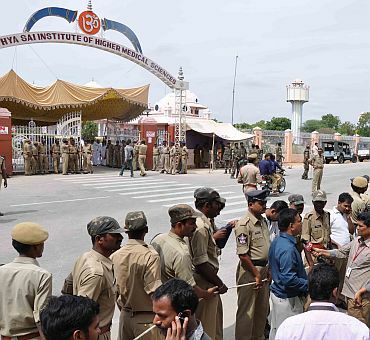 Transactions and construction have, meanwhile, pretty much ground to a halt, with the worst affected being the 6,000 to 8,000 casual workers who had been streaming into Puttaparthi from neighbouring villages. The fallout of fewer devotees would be reflected in the books of the towns' banks as well. In a 2-kilometre radius in Puttaparthi, there are 10 banks, with the market leader being State Bank of India. 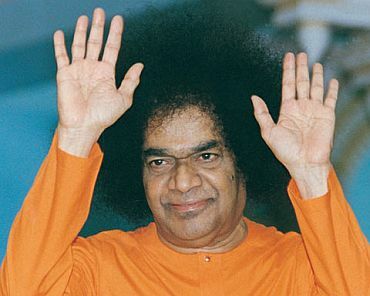 SBI holds the account of the cash-rich Sri Sathya Sai Central Trust and is thus more or less safe. 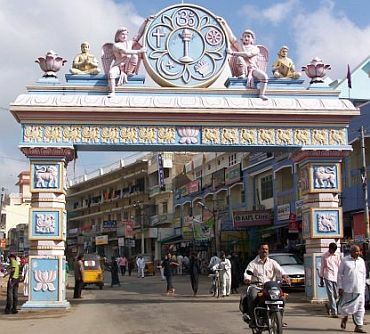 But with devotees' future visits to Puttaparthi likely to be of shorter duration and frequency, Non-Resident Indians and foreigners with bank accounts in Puttaparthi could well choose to repatriate their funds. Foreign exchange trade would also, naturally, take a hit. A private sector lender which had decided to open a foreign exchange counter at its Puttaparthi branch is already reconsidering its plan. The hotels that have mushroomed all over the town, in various shapes, sizes and budgets, would be another victim of the dip in visitors. Among these, the bigger hotels are a little less anxious. "There will be a decline but it's not something I'm worried about. The old devotees will still keep coming. I have already received bookings for November, December and July," says R Padmanaban, managing director and owner of Sai Towers, the first hotel in Puttaparthi. His hotel is one of the few which enjoy 50 per cent occupancy even in lean periods. Others are not so optimistic. "This business is not stable even in the normal course. It is only on a few days of the year that there's 100 per cent occupancy. With something like this happening, I have no idea what occupancy will be like in future," says J Prasad, general manager of Sai Renaissance. 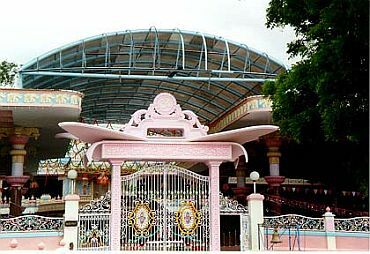 One section that should continue to visit Puttaparthi will be the patients to Sri Sathya Sai Institute of Higher Medical Sciences, the 300-bed super-specialty hospital where treatment is absolutely free. But there is less clarity about the doctors who choose to serve there. "Finding doctors was a challenge anyway. Most don't stay here for more than two years, mainly because this is an out-of-the-way small town with little choice in terms of diversions of any kind, which is hard on the doctors' families," says A Jagadish Chandran, the hospital's joint director. He adds that it is too soon to say whether Sai Baba's death would mean fewer doctors choosing to work at the hospital. The trust's 200-bed super-specialty hospital in Whitefield in Bengaluru also faces a human resource crunch, but there it is a question of being unable to provide salaries that can compete with those offered by private hospitals. 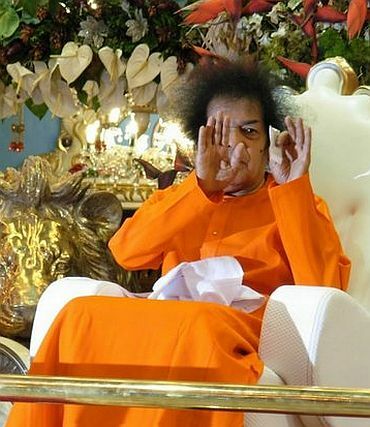 What makes it tough to assess the immediate impact of Sai Baba's death is the fact that April, May and June have traditionally been, in localese, 'unseason'. Even when Sai Baba was present, the searing heat ensured that the crowd thinned to a trickle. Most people thus say it will take six months to gauge the real impact. The first pointer will come in July, during Guru Purnima, previously a time when devotees descended on the town in large numbers. And November, when Sai Baba's birthday is celebrated, will be the final litmus test. The locals are, meanwhile, hoping for two things to happen. 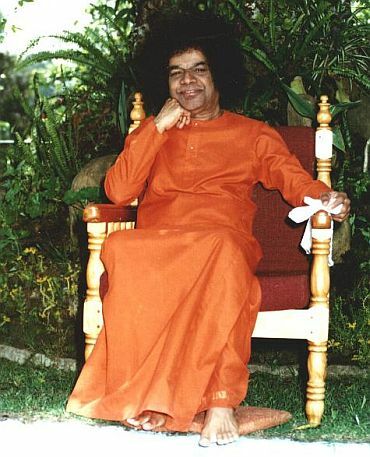 One, that Puttaparthi would be made the capital of a new Sathya Sai district carved out of Anantpur, which would ensure more employment opportunities, better infrastructure and an increased inflow of people. The local MLA, Palle Raghunath Reddy, a member of the opposition Telugu Desam Party, says this has already been suggested to the government, though not yet as a formal proposal. Reddy says there is also a proposal to make Puttaparthi a solar hub, and industrialists, including Ratan Tata, have been approached to set up some kind of industry near the town. 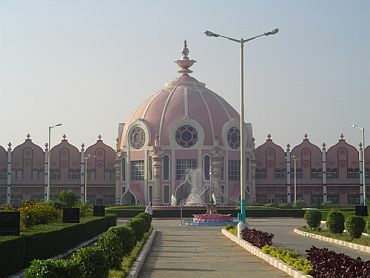 Two, they feel Puttaparthi will become like Shirdi, where thousands come to visit the shrine of the original Sai Baba (a Muslim mystic venerated by Hindus), and not a man. 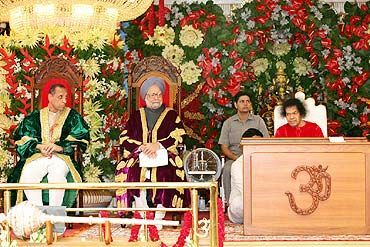 But, even if Puttaparthi has a head start in terms of infrastructure, it might still take decades for it to acquire that same stature without Sai Baba's physical presence. Much also depends on how the Sri Satya Sai Central Trust, in charge of administering Sai Baba's various institutions, handles his legacy. When Sai Baba was alive, his devotees spoke admiringly of his many 'miracles'. Now that he is dead, it might take a few more to keep the crowds coming.